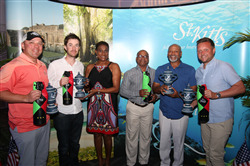 St. Kitts Tourism Authority hosted its ninth annual St. Kitts & Nevis Admirals Cup Golf Tournament, with the UK team second place in the Pro-Am Division. The UK team representing Wentworth Golf Club, made up of Warren Harmston (PGA Professional) and Leyton Hardwick (Amateur) and two other amateurs from U.S., finished second with a score of -30 using a daily two-ball scoring format. Their runner-up finish saw the outpace Pro-Am teams from the USA, Canada, UK and Caribbean regions at the event, which took place from 2 to 7 February. The competition was won by the Howell Park GC team, from the USA. The St. Kitts & Nevis Admirals Cup is the destination's premier event for visiting golfers. Played annually in early February, the Admirals Cup Pro-Am is a five-day team tournament, featuring two separate competitions. The Pro-Am Division affords three amateurs the opportunity to play alongside PGA Club Professionals and mini-tour professionals. The Am-Am Division allows two amateurs to pair up and compete against other two-person teams from golf clubs across the globe in a best ball, stableford points competition. Intoxicating natural beauty, sunny skies, and the surrounding warm waters, and black sand beaches combine to make St. Kitts & Nevis one of the most seductive golf spots in the Caribbean. The St. Kitts & Nevis Admirals Cup is the only golf event of its kind with tournament rounds contested simultaneously on two different Caribbean islands, the Royal St. Kitts Golf Course in St. Kitts and Robert Trent Jones II Course at the Four Seasons Resort in Nevis. In the nine years the event has been running, more than 125 teams have experienced all the elements St. Kitts and Nevis has to offer as a must-visit destination for traveling golfers. Beyond the golf, attendees enjoyed downtime on the island – snorkelling in St. Kitts’ crystal clear waters, historical tours of the island, and several nightly parties, including a private concert by contemporary jazz saxophonist Elan Trotman and a special Viewing Party on the beach to watch the NFL’s Super Bowl 53. UK golfers wanting to experience the Admirals Cup golf tournament should save the date for next year’s 10th Anniversary edition, from 1 to 6 February 2020. Early entry discounts will be available starting April 1 and continue through to September 15, 2020. Those interested in sampling a St. Kitts golf event sooner in St. Kitts can sign up to the St. Kitts Open, taking place from 7 to 9 June 2019 at the Royal St. Kitts Golf Club. For more information visit www.golfstkittsandnevis.com or contact the St. Kitts Tourism Authority’s preferred Golf Tour Operator in the UK, A Golfing Experience, on 01494 875164 or email steve@agolfingexperience.com.